I was demoted all back to East Blue league - worse than i expected/remembered but at least it makes the runs easier and fast so i was able to get TM Shanks maxed quite fast. More importantly.....did a single pull and managed to get Perospero - sweet, he was my most wanted of the Big Mom set. So missing Anni doesnt feel that bad anymore. Oh and finally managed to clear Raid Blackbeard - i used a Legend Blackbeared team that worked out great, only bummer was the lack of friend Legend BB Captains, using ones without his skilled max was less safe. I'm actually surprised at how... not sucky... my teams are doing. Usually at this point (Nav level 26 or so) I need to start adjusting teams or losing and dropping a few, to climb back up. But my teams are all overkilling the bosses. Only Shanks is an issue since I need to rely on BM friends, but other than that, things are... decent. My pulls were a dupe Garp and a dupe V1 Lucci, who I had forgotten even existed in this game. Even with his 6+, he has not aged well in this game in the least. People rag on Boa and Sengoku but I've seen them used more often than V1 Lucci. This also got me thinking as to whether or not we'll ever see a 6+ Log Luffy. If it hasn't happened yet, I'm beginning to think it never will. Log Luffy probably is the toughest spot, being a Log legend and also a Luffy legend. I think he'd be the last legend to get a 6+, if he ever gets one. Plus he's so iconic in terms of gameplay, they'll probably have to keep a similar CA and nowadays players just don't use legends with complex tap timing orders. I called the top 4 ^^ I did think that Lace would get V2 Akainu spot though but I guess Lace is too old now and most people have him. The top 3 was a no brainer, the 3 strongest leads. Katakuri probably got voted in because of his popularity in the manga, he doesn't really deserve his spot in terms of raw power/usefulness. New Sabo has a bad rep for some reason I think, for being too restrictive and linked to 2 currently weak classes (Shooter and Fighter) maybe. Whitebeard was guaranteed so I guess that's why he got so few votes. Yup I'm in the same boat, in terms of margin, this is the most comfortable TM so far, I'm at nav level 28 and still doing a hefty amount of overkilling. The guaranteed 1.5x stat boost really helps. I'm also very glad that seemingly almost everyone has pulled Big Mom last anni, relying on FC for Shanks and Mihawk. I didn't play yet today and I already dropped 600 ranks, people are going ham it seems... JP never ever got guaranteed bird, this is actually pretty incredible that they gave that to Global. Plus on JP, TM with birds actually go slower than normal TMs without birds (cfr Kaido vs Nami) beause they nerf the points growth into the ground. I reached 3M in a day or so on Global with 12-13 runs or so, it took me 4 days with 33 runs on JP and my JP teams had bigher points multipliers. The difference in pace between both versions is ridiculous at this point. yeah is the difficulty growth not as bad on this TM or something? My teams are also holding up fine. Only thing that's starting to be a close call is my lazy Yassop team. I'm so thankful to have gotten G4 in the anniversary, I don't know what I would have done for Beckman or Shanks without him. This TM has also made me much more aware of the proper way to play him. Beckman is cake but Shanks is tricky since I've only got 3 rounds to get one of my G4 up to max gear point, which sometimes is cut a bit close. Double WBv2 is great for Beckman. Breeze through beginning stages, take hits from stage 6 since you have a ton of HP, and just KO. Burst on stage 7, super easy. Shanks I'm using a BM/WBv2 team, basically the same but I can use Log Vivi for orbs to make it easier. Just pulled this guy from my gold rewards ticket!!!! Apparently global-exclusive Akainu ranking coming. Time to break out the unevolved V2 Shanks, V2 Whitebeard, Lace and co. Thanks! Now I dont even care what my legend pull is haha. I dont think I have any unevolved legends sadly enough. Half-assing the hell out of this TM. Hovering around rank 7000. First red was Tesoro though, so that's cool. Anyone know how to make it into the Grand League? Do I need to hit 5 million? While a big part of it is that we're always on 2x stats thanks to the bird, I also think Beckman's stats aren't quite as high as most TM bosses (likely because he rains debuffs on you). That's just a guess on my part, I didn't check other TMs, but he certainly seems low. But yeah, none of my teams are in any danger this late into TM. Still mostly KOing halfway through the attack chain. Even the severity of Beckman's ATK Down is pretty low, I could one or two turn him even with the debuff. My pulls haven't been great, but I do appreciate the amount of LB points I'm getting, especially for Big Mom, Brook, and WBv2. Gonna have them, the Charlotte kids, and Chainmail Zoro all mastery point maxed by the end. we are getting an exclusive 1 turn damage ranking. You need to be ranked in the top 2k (?) or something to get promoted to the upper league. The game should tell you via the treasure map icon, if you're within the promotion range, your Merry boat should display a red (or gold?) arrow pointing upwards. Map level 31 is when TM Jack stops one-shotting Lucky Roux with his special. Level 32 for my friend Shiki special to stop one-shotting Yasopp. The only thing I have any concern over is making sure my friend BM gets a Selma orb eaten because I need to use her special against Shanks. Every thing else has turned into a boring tedious grind, in the one true treasure map fashion. Free Ace and all we had to do was get murdered by Japan in a global ranking event. Fitting, I guess. Free Ace? Unexpected, I thought he'd be Ray Shop for sure. People seem to be slowing down in TM -- I only dropped 200 ranks overnight, usually it's more like 500 or more. Not that I'm complaining. Hoping to come in the low 2000s. I'm almost at 10mil point, holy hell. Oh WC Ace dropping in the mail was unexpected indeed. I'll gladly take it, he's pretty good with WC Sabo (who currently is in the TM blue ticket shop in case people didn't get him last World Clash). I hope they won't be boosted for next TM which should be Boa because they were pretty much made for a certain mini boss of TM Nami. For some reason I thought there were 2 more days of TM but this already is the last day. I'm currently at the edge of top 1.5k but not gaining enough to make a proper push for it unless I spend a gem or two but I really don't want to. I'll wait until I see what my bento box luck is today. Oh wow, double EXP Fn's are gone. Not that I was using all my stamina anyway, but thought that was interesting to note. Should probably do that EXP island before it goes away today... not for exp, but for the gem. My TM ranking ticket on JP was V1 Shanks, who is actually new so I'll take it. And wait until they introduce 7 stars to the game and he turns into the most OP unit ever. 1) Global trying to catch up TM wise because they skipped January for no good reason. They might have a TM every 3 weeks instead of 4 weeks at some point and maybe they think shorter TMs will make the farming more bearable for the players. 2) A change made based on polls and multiple feedbacks from the playerbase. I think quite a few people on Global have been complaining that TM is too long. This 4 days format might be permanent in that case. Which would make them the same length as on JP. Finished this TM, always feels like I can release a nice sigh of relief after getting one done lol. Not gonna be able to play much today. I'm in the low 1900s, so there's probably no way I drop below 4k even if I stop completely right? Nice gift with that free Ace - didnt expect that. PS: Is there a list of units that have Double Special Activation like TM Shanks ? If you scroll down on the left there's a filter for double special limit break. for some reason i missed it when i checked for it earlier. Both of my gold tickets are Suleiman. Red ticket's a dupe Blucci. Oh well. I reckon you should be fine for top 4k. Might want to have a quick look at the rankings 1 or 2 hours before it ends. 5 million point legend was Log Luffy. Well uh... He's new! Yeah if I wanted to I could have ranked much higher. Normal AND TM stamina is overflowed. Ridiculous. Stopping with 40 min to go and rank 2157. I won’t drop a tier in that short of time and won’t advance either. 12.8 million points.... with better boosters I can’t imagine how high I could have gone. Ended up just above 3k, which is fine. Just wanna get above 4000 these days, the rewards aren't terribly different from there until the really high ranks. Akainu ranking is butts. Threshold, rewind, and sailor blow-aways, gotta account for all of that plus actual damage. Note that Akainu seems to blow away the same positions based on the buff, and multi-buff specials (Cracker, WC Ace), will default to just one of these. Got to 8 million with double Suleimon, RR Cracker, Wild Zoro, Bobbin, and WCI Brook, but I won't be able to get any higher there. Might just wait for something that doesn't require an unevolved legend (WBv2 would be quite useful). EDIT: Got it. QCK Garp Captain, Rayshop Cora and WCI Brook on the left, Bobbin and World Clash Ace on the right (with Ace in the bottom right), and unevolved Luffy/Ace Friend Captain. Use Cora first (who doesn’t set chain due to the rewind, avoiding a launch), then Brook, Bobbin, and Garp. Then use Ace, who gets launched, then you can use Luffy/Ace for their better CA, avoiding a launch again due to orbs already being boosted. Then just attack with all perfects ending on Bobbin due to his sailor ability. Finished TM at rank 1314 thanks to two very clutch bento boxes in the last hour, I was outside of the top 1.5k before that! Competition seemed to slow down a bit over the final day. Got quite a few large LB potions this TM, really needed those, was quite depleted after pulling so many new units during anniversary. New Spring campaign is pretty much get your 3 daily gems and bail out. It's pretty funny that we're getting a "trial version" of the Manual Trove, it must be doing pretty poorly. Might farm it but at first glance there's nothing I need from it. Ranking was easy thanks to a team on reddit. Similar setup as above. Uses pesepero and bobbin, world clash ace and sabo, and a friend Luffy/ace. 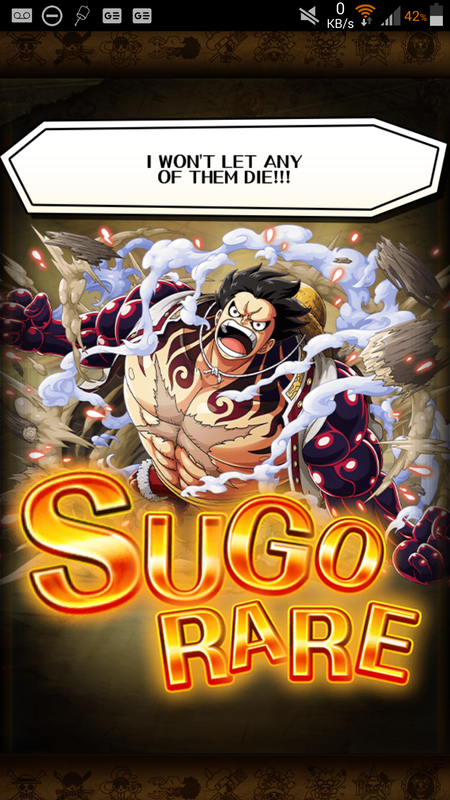 Raid shanks mihawk was the last unit. Worked very well on the first try. Other two were easy as well. Just mono teams and win. Raid big mom is datamined. Seems interesting but niche like all raids. Yeah, Raid Big Mom is weird. Might be genuinely useful for Enel, and...not much else. I did see a good point on Reddit that she'll be useful for any TM she's boosted in since she can probably one-shot bosses for most of the TM. Meanwhile Global got Invasion Sengoku and Colo Tamago added, so those should be coming soon, along with the Jinbe v2 batch. The rest of the Invasion units should be getting their limit breaks soon as well, so I wouldn't be surprised to see some Invasion-focused events in a couple weeks. 1) Wow the new Coliseum Katakuri is brutal, just got destroyed in Underground difficulty. I wasn't ready for 3 turns silence, 6 turns despair, Kata changing his own type to the one strong against your captain (RIP V2 Kata), 3 turns damage IMMUNITY of the type he's weak against, heals back to FULL AND remove all buffs every time a damage dealing special is used(RIP my neptune/V1 law/Snakeman team). I thought I was smart and stalled all the debuffs but as soon as they were gone he hit me with a 99 turns "all colour orbs count as matching" debuff. Oh and he also has over 2 million HP just on Underground. I can't even imagine what he does in Chaos difficulty. Such a huge middle finger to Warco, V2 Kata, V2 Doffy, that's the second piece of content where they are rendered useless in the past two weeks. Seems like we might be heading back towards a "pure damage" meta headlined by Sanji/Judge : just highest orb, atk and colour affinity boost as possible. Might start seeing more 2.25x boosts and higher chain locks. 2) Disappointed with Raid Big Mom, she seems incredibly niche as people said, even by raid unit standards. 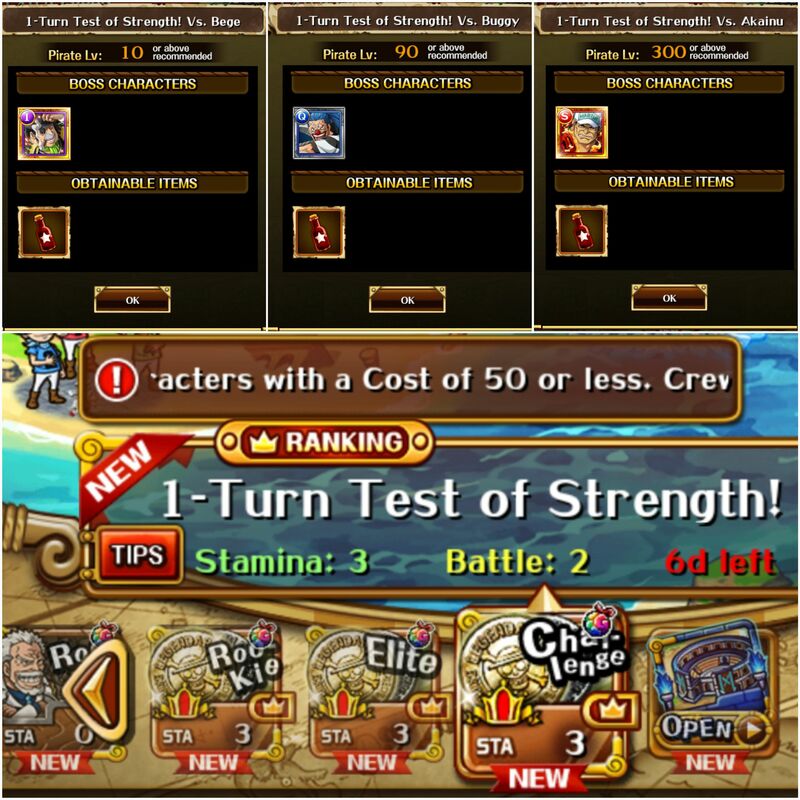 Being a decent room clear for Enel and a couple TMs isn't a good prospect. I really like the art too and I was happy she wasn't STR for once. 4) Raid Rayleigh is part of the half stamina Clash of Clashes, good opportunity to farm 8 copies for his LB. He gets an amazing sailor ability that reduces his CD by 3 each time a special is used, will make his universal atk boost very spammable. 5) Since there's nothing else to use stamina on today on Global, I'm going to farm Raid Bellamy, his LB is out and it turns him into a good orb booster/HP cutter. Beat the Big Mom forest (thanks Warco) and upgraded her ship. I am now at a bit of a loss on what to do with it. Don't think I have any good captains to go with it. Tesoro? My 3 million point red was Kung Fu Luffy (dupe). Hit rank 2819, was shooting for above 3000, so im okay with that. Wanted to push towards the tougher league but didnt make it. Haven't even looked at teams for these ranking missions yet. Was just wondering this. Thanks for the heads up. Just completed all the ranking missions as well, didnt even need an unevolved legend! Rainbowed Raid Bellamy and Fujitora, it's pretty cool how they are permanently available nowadays. Working on Raid Caesar today, he has his uses in TM. And then maybe Kizaru in the next few days since there's not much to spend stamina on atm. On the JP side, Colo Kata farming in Underground is going fine, using a comfortable V2 Shanks team. Grats! Didn't know it was possible without an unevolved legend. I saw a lot of teams with TS Luffy and Franky, pretty nice to see all that diversity. ANOTHER FujiV1. This guy is haunting me. Tablet luck was as bad as ever. So close to rainbowing Lucy...I did manage to get Cora's Cooldown Reduction maxed with 12 tablets, which sounds ridiculous now that I type it out. I think he'll make better use of it than Boa or G4v1, at least. Also decided to start using legend dupes for LB...the Raypoints always seemed like a better deal, but there's just nothing to spend them on at this point. An extra 1% damage reduction is better than points that sit around and do nothing.